Figure A75. Sakhalin anomaly, interpreted as the Sakhalin slab, with (horizontal) [vertical] cross sections through (A)[D] the UUP07 p-wave) and (B)[D] the combined SL2013 and S40RTS s-wave models at 950 km; C) the location of the modern geological record that we interpret to have formed during the subduction of the slab. 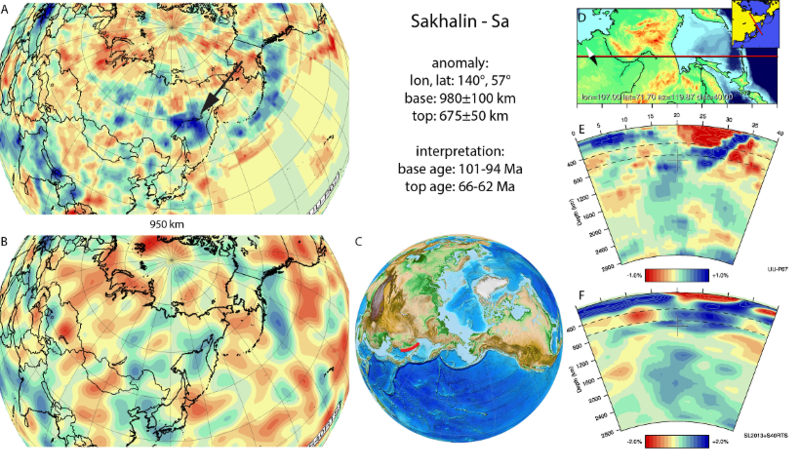 The Sakhalin anomaly (Figure A75) is located below northeast Asia within the upper part of the lower mantle. In previous tomographic studies it has been interpreted to as a subducted slab of the Okhotsk plate (Gorbatov et al., 2000). On the basis of the Kamchatka slab to the east and shallower in the mantle, van der Meer et al. (2010) inferred that the Sakhalin slab likely subducted in Late Mesozoic to Early Cenozoic times. In the tectonic model of Nokleberg et al. (2000) subduction of Okhotsk lithosphere initiated at the continental margin below the East Sikhote-Alin arc in the Late Cretaceous. The Sikhote arc consists of Cenomanian-Danian arc volcanics, which we adopt as the age range for the Sakhalin slab. Subduction ended in the Late-Cretaceous-Paleocene due to accretion of the Okhotsk block, resulting in an eastward jump to form the Kamchatka-Kuriles arc and slab .